First introduced in 1958, the Hermes 3000 was an instant success and widely popular in the U.S and international markets. 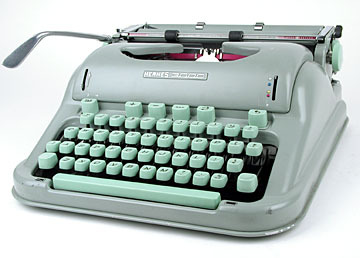 Feature for feature, the Hermes 3000 was one of the most sophisticated manual portable ever made. Its major innovations included the world's first lightning margins (visible in front of the sheet of paper), a control board grouping all the service keys, and integrated base plate and cover to facilitate handling and carrying. It is much more than a versatile all-around typewriter. It is designed for office use, too, with many features common to office machines but seldom found in portables. Its ease of handling and clarity of type make it the ideal personal typewriter for writers and executives. Its compactness and lightweight turn the Hermes 3000 into the ultimate in students portables. For its versatility, performance and durability, the Hermes 3000 is regarded by many to be the one of finest portable typewriters in the world.